Queenslanders are invited to celebrate in the State’s first Symposium and Expo on Queensland’s Muslims this Saturday 31st of March at Brisbane’s Grand Mercure Hotel. The event, a joint initiative of the Islamic Council of Queensland (ICQ) and The Department of Families, Community Services and Indigenous Affairs (FaCSIA), will run all day from 9am to 5pm and the Symposium will commence at 11.30am. The Expo will showcase the achievements, contributions and involvement of Queensland’s vibrant and diverse Muslim community to Australian society. Various State and Federal Government and not-for-profit organizations will also be taking part and over 40 organizations and individuals will be participating in the Expo. There will be presentations by a number of prominent members of the Muslim community at the Symposium culminating in two panel discussions on implementing social participation and the challenges facing the next generation of Muslims in Queensland. President of ICQ, Mr. Suliman Sabdia, said that this was a unique opportunity for Queenslanders to meet with the local Muslim community and learn about the significant role that many of them are playing in the economy of the State and the social welfare of its citizens. Griffith Islamic Research Unit Director, Dr Mohamad Abdalla, will feature as the keynote speaker, discussing the co-operation between civilisations and Islam’s contribution to Humanity. The Expo will provide an opportunity for the community to access information on services and facilities available from all levels of government and community sectors. Childminding facilities will be available on the day, as well as free showbags and refreshments. The event is open to the public and for more information call 0402 026 786 or email admin@icq.net.au. Aged Care Service held the first of many carer/care recipient dinner on Friday 9th March 2007. According to the organizers it turned out to be a very successful and memorable event. 52 carers and care recipients attended. The event was also used to garner responses from the carers and care recipients on their level of satisfaction with IWAQs aged care service (Extended Aged Care at Home Dementia [EACHD], Community Aged Care Packages [CACP] and Home and Community Care [HACC]). Preliminary analysis of the evaluation responses suggest a high level of satisfaction with these services. Seeratur Rasool is an annual event at Australian International College formerly known as Brisbane Muslim School. Students of the school will deliver speeches and sing nasheeds and the event is an opportunity for the public to meet together at the school and take part in a quiz program, listen to talks by learned Imams and Scholars and join in the lunch that will follow. Are you looking for full-time or part-time childcare? Would you like your children to be cared for by an early-childcare professional in a home environment? Would it be a bonus if the carer was Muslim? Then call Yanti on 3319 0101 or 0404 926 236 at Star Family Day Care - where your child is the star! Places are available Monday to Friday, full-time and part-time. Government subsidies are available under the Carina Family Day Care Scheme. Yanti is located in the Mt Gravatt/Wishart area. Yanti is fully qualified and experienced, and has programs in place to cater for children of all ages. She can also implement Muslim-specific programs, such as teaching the Arabic alphabet and daily duas, on request. This work is on a casual basis from Monday to Saturday. It's desired that you would have worked with the frail and elderly people from various cultural backgrounds. The hourly rate is in accordance with the Accommodation Award. To apply for the position or to find out more information the IWAQ offices on: 3272 6355 or 3272 6422. Ms. Salma Mousali, is the new Muslim Police Liaison Office at Upper Mt Gravatt Police Station. Salma will advise and educate police officers on the beliefs, needs and protocols of the Muslim/Arab communities. She hopes to improve community knowledge of law and order issues and policing services and establish and maintain communication between the community and the police. She plans to work together with the community and the police to identify potential crime or disorder problems within the community and advise and assist in the development of crime prevention strategies. However, as a Police Liaison Officer, she does not have the power to detain, arrest, search or fingerprint a person but can assist the Police with these tasks in certain circumstances. Salma is happy to answer any questions and meet with individuals or groups/organizations within the community to discuss issues/concerns or to meet informally to get to know each other. The Crescents of Brisbane Team raised over $400 at the tea, coffee and cup cake stall at the Runcorn State School's Harmony Day fete on Friday night. The monies will go towards supporting the School's Harmony House project. Aisha Dennis, who is its key protagonist, will explain the purpose of the project in her talk at the Symposium and Expo on Queensland Muslims next Saturday. A large crowd turned up on the night and were entertained by a number of dance groups reflecting the diversity of the school population. 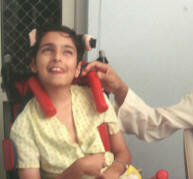 Several months ago CCN brought you the story of Abdullah who was in need of a vehicle with a disabled-hoist. Crescents of Brisbane was one of the many supporters of the fund raiser for Abdullah. This week we are proud to announce that all the money raised exceeded the target of $12 000 and has been passed over to Abdullah's mother to purchase the vehicle and the disabled-hoist installation. The bank account for acceptance of donations has now been closed. SLP: the Sister's Learning Program has been postponed for the month of April. When the program re-commences we will let you know Insha-Allah. IFA Youth is assisting in recruiting models for the ICARE fashion show. If you are interested and require more details please contact ifa.qmt.org.au or ICARE directly. Saajida Khan, daughter of Ismail and Zahira Khan of Calamvale, was married to Shanawaz Patel, son of Feroza and the late Aziz Patel of Lenasia, Johannesburg. The marriage ceremony and reception took place in South Africa in January. While I was working as a pediatric nurse, I had the difficult assignment of giving immunization shots to children. One day I entered the examining room to give four-year-old Khulsum her shot. I have dealt with many communities with regards to charity fundraising events and nothing compares to the contribution and generosity displayed by the local Muslim community. My wife Nadine and I often ask whether this community support is faith based or just general concern for others, but that really doesn't matter to us as either way it is quite astounding. The economy maybe be going ahead in leaps and bounds, but there is a lot of pressure on communities in this day and age as there is a sizable minority who do need assistance, locally, nationally and internationally. It is very easy (and most do) to only focus on the needs of "their own" community with little interest in the community as a collective, but that certainly is not my experience with the Muslim community - especially those associated with Crescents of Brisbane. The Muslim community may be under the spotlight as the current populist political punch bag in some quarters (the Irish have had their turn !) and it would be very easy for them to withdraw, but they haven't and should feel very proud of this. Members of the Kuraby Lions and the wider community involved in last weekend's fundraiser have nothing but admiration for the community and long may such positive associations in the name of helping others continue. I have recently relocated to Brisbane and have a 2 year old son. I would like some recommendations from other Muslims in the community about suitable play schools/day care as I am currently looking for a job. Please could someone advise me in this regard? Any information would be greatly appreciated. [Editor] If any reader can help email theteam@crescentsofbrisbane.org with the details and we will forward them on.